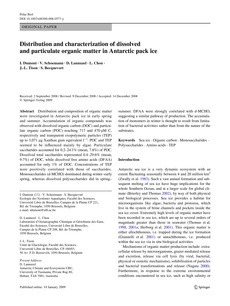 Distribution and composition of organic matter were investigated in Antarctic pack ice in early spring and summer. Accumulation of organic compounds was observed with dissolved organic carbon (DOC) and particulate organic carbon (POC) reaching 717 and 470 !M C, respectively and transparent exopolymeric particles (TEP) up to 3,071 !g Xanthan gum equivalent l� POC and TEP seemed to be inXuenced mainly by algae. Particulate saccharides accounted for 0.2�.1% (mean, 7.8%) of POC. Dissolved total saccharides represented 0.4�.6% (mean, 9.7%) of DOC, while dissolved free amino acids (DFAA) accounted for only 1% of DOC. Concentrations of TEP were positively correlated with those of saccharides. Monosaccharides (d-MCHO) dominated during winter杄arly spring, whereas dissolved polysaccharides did in spring� summer. DFAA were strongly correlated with d-MCHO, suggesting a similar pathway of production. The accumulation of monomers in winter is thought to result from limitation of bacterial activities rather than from the nature of the substrates.